"It Happened One Nut" was the sixth episode of the third season of the Daria TV series (episode number 306). It first aired on MTV on July 7th, 1999 and was written by Rachel Lipman. When the students receive the results of their career aptitude tests, Jane learns that she's suited to be an accountant (the same answer she's received every year, thanks to her selecting the same letter for each question), Kevin is suited to be a gas station attendant, Quinn is perfect as a neck model, and Daria, to her annoyance, is destined -- thanks to her apathy and her lack of desire to interact with other people -- to be a mortician. Helen insists that Daria get a job to improve her interpersonal skills and focus her career goals, and makes Quinn get one as well (so she can pay for her $500 modelling portfolio on her own). Daria opts instead to take social skills counselling at school, but when that ends in failure (due to Tiffany's glacially slow approach), she's forced to take a job that Jake sets up with a client. Daria's not thrilled to work at the mall's nut stand, It's a Nutty, Nutty, Nutty World, and is even less so when she finds she's working next to the brain-dead Kevin. "It's worse than school," Daria tells Jane. "The rules are stupider, and Kevin is very, very close." That's topped by her humiliation when Trent finds out about her job, despite Jane's best efforts to steer him and Jesse Moreno away. When Jane is unable to coax Daria out of the store's back room, she puts in a call to Helen and pretends that Daria is being hidden away from the public while the less qualified Kevin is put in the spotlight; enraged, Helen storms into the mall and "rescues" Daria. They both encounter Quinn, who's caused a ruckus at her pet store job when she enlists the help of Joey, Jeffy and Jamie to find a boa constrictor she accidentally let out of its tank. In the end, everyone ends up losing their jobs, including Kevin (thanks to the ever-jealous Brittany). Later, Quinn gets too close to Daria's old Nut World uniform and gets a neck rash due to her pistachio dye allergy. Seeing Quinn lament the end of her neck modelling career? Now Daria has job satisfaction! This episode was named after a romantic comedy film called It Happened One Night. Several of the black female "background characters" are shown hanging out at the mall - Jennifer, "Orange Girl" and "Bib Overalls", all in Daria's year and in some of her classes. It implies all three are friends - and that's notable, because despite Jodie Landon's repeated complaints about being one of the few minority students at Lawndale and the pressure that puts on her to be a perfect 'representative' of her race, she's never been seen hanging with those three or anyone else. Jake does consulting work for Nutty World's national office. Akin to her protests of not being miserable in "The Misery Chick", Daria is very ticked off by being told she'd be a good mortician. Quinn is allergic to pistachio dye: it gives her a rash. 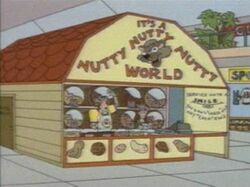 The Nutty, Nutty, Nutty World manager is not named in the episode. He is voiced by Zeke Farrow. This page was last edited on 3 July 2017, at 12:37.